We recently stayed at Dicky Beach Holiday Park on the Sunshine Coast. Following are a few photos of the area and local attractions. My review of Dicky Beach Holiday Park is here. Dicky Beach was named after the iron steamboat, the SS Dicky, which ran aground in 1893 in heavy seas. The ship was re-floated, but heavy seas pushed the ship back onto the sand where it remains. No lives were lost in the shipwreck. Apparently the SS Dicky is the most photographed shipwreck in the world due to its location on a popular tourist beach. Dicky Beach is the only recreational beach in the world to be named after a shipwreck. 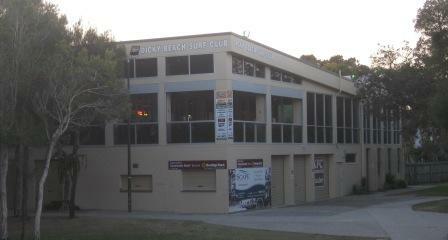 The surf club is adjacent the Dicky Beach Holiday Park, and behind the sand dunes of the beach. Apparently the surf club gets ocean views. We did not dine at the surf club because, being the end of school holidays, the Wreck Restaurant was booked out. The restaurant is obviously popular. A strip of shops is adjacent the beach and holiday park. Shops include an IGA, three fish and chips shops, a cafe/restaurant, a chemist, bottle shop, Indian restaurant, and around the corner was a Japanese restaurant.